Admired the Carrie Hammer newspaper skirt but I couldn't shell out almost $300 for a skirt so I decided to make my own. If you're interested in making this skirt, check out the tutorial here. This is my second DIY skirt and I am very happy with the result. I paired it with a black top to keep the rest of the outfit neutral so that the skirt can truly shine on its own. I look forward to wearing this skirt without tights when the weather gets warmer. I picked up this belt from Talbots a few weeks ago in 2 colors (black and deep burgundy) and have been wearing them non-stop. This belt literally goes with everything.It has a classic look with understated hardware. The best part? You can slide the extra length inside the buckle so it's invisible from the outside. I punched a few extra holes so I can wear it different ways. It's not available online anymore but check with your local store. The Talbot store near where I live had a rack full of these belts a few weeks ago. I would love to own one of the designer belts one day. Until then, this belt will do. On a related note, if you're looking for a more affordable version of the uber luxe Hermes Constance belt, check out the letter belt buckle from C. Wonder. Pretty good dup, I must say! A reminder that my giveaway for a workout top from Albion Fit is still going on. If you haven't entered, you can do so here. I will announce the winner next Sunday. I'm sure everyone in the Midwest is looking forward to the nice 50-degree weather this weekend. Hope everyone has a fabulous one! fabulous skirt!! you did such a great job on it and the print is adorable! Lovely skirt! I love the print. Sweet skirt, Sydney! Sweet outfit as well. I like the burgundy coat along with the black booties. This is a very chic and cool look. LOVE the skirt! And I adore the booties you have! Too bad Macy's isn't willing to ship them to Canada - boo! I love the skirt. It's such a fun print. I wish I know how to sew. So pretty! 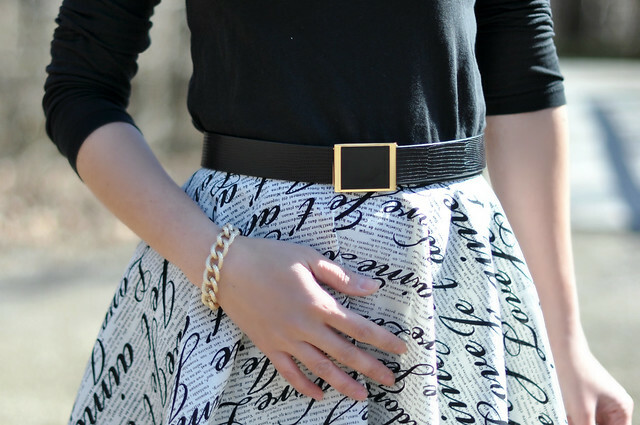 This is such a beautiful, classic look but the print on the skirt is a great twist! Love the outfit. Really cute... Great job! Wow! The skirt looks awesome; love this look! Beautiful DIY skirt Sydney! I'm loving the cute prints - I was just about to ask where you purchased it from until I realized that you made it yourself. You're so talented! This is a really cute skirt :) Love the print on it too! I love your version of the newsprint skirt because instead of newspaper, it has a lovely soft font on it.